We’d love your help. Let us know what’s wrong with this preview of Prison Industrial Complex For Beginners by James Braxton Peterson. 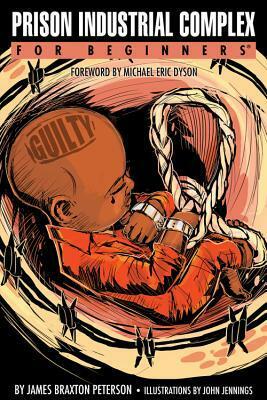 Since the early 1990s, activist critics of the US prison system have marked its emergence as a "complex" in a manner comparable to how Pres Prison Industrial Complex For Beginners is a graphic narrative project that attempts to distill the fundamental components of what scholars, activists, and artists have identified as the Mass Incarceration movement in the United States. Since the early 1990s, activist critics of the US prison system have marked its emergence as a "complex" in a manner comparable to how President Eisenhower described the Military Industrial Complex. Like its institutional "cousin," the Prison Industrial Complex features a critical combination of political ideology, far-reaching federal policy, and the neo-liberal directive to privatize institutions traditionally within the purview of the government. The result is that corporations have capital incentives to capture and contain human bodies. The Prison Industrial Complex relies on the "law and order" ideology fomented by President Nixon and developed at least partially in response to the unrest generated through the Civil Rights Movement. It is (and has been) enhanced and emboldened via the US "war on drugs," a slate of policies that by any account have failed to do anything except normalize the warehousing of nonviolent substance abusers in jails and prisons that serve more as criminal training centers then as redemptive spaces for citizens who might re-enter society successfully. To ask other readers questions about Prison Industrial Complex For Beginners, please sign up. As a back sociology professor, JB Peterson describes beautifully the prison industrial complex with cartoon illustrations for beginners. He goes into depth about the manifestation of these problems and how they affect us individually. The book caps off with a call to action with concrete steps on how to combat the PIC. The book brought up some things that you won't find in a school history book. I enjoyed reading the book although I felt like the author was going back and forth between writing a book and writing a dissertation. I would have liked for the author to go into more detail about some of his ideas. This book looks at how, and why, America leads the world in the number of its citizens per capita that are incarcerated. The term "prison industrial complex" may be a new term, but it is a very old concept. Of course, it all started in the days of slavery, when millions of Africans were brought to the Western Hemisphere. In 1829, in Philadelphia, the Quakers and other reformers opened the Eastern State Penitentiary. Solitary confinement was thought to provide a prisoner the space and time to reflect and consider God's judgment. The cells required the prisoner to bow when entering or leaving the cell. The only small window was in the ceiling; it was sometimes called "the eye of God." The Thirteenth Amendment to the US Constitution, the one that abolished slavery, contained a big loophole (anyone convicted of a crime was subject to involuntary servitude/slavery) which whites were quick to exploit. New laws were created, including Jim Crow laws, to keep blacks oppressed as much as possible. More recently, there are many parts to the Prison Industrial Complex. Many inner city schools are closing, and those that are still open are starved for money. This reduces the chances of the average young person doing anything except joining the "underground economy" and ending up in jail. There is little, or no, attempt at rehabilitation in prison. Private prison corporations will cut costs wherever possible (to boost profits) including on things like food for the prisoners. Many well-known corporations use prison labor. The "war on drugs" has been a total failure. All that it has done is jail thousands of non-violent drug offenders. Recidivism rates in American prisons are high. A sure political vote-getter are the words "tough on crime" even though actual crime rates have dropped by a lot. Did I forget to mention "stop and frisk" and Black Lives Matter? This book includes a syllabus for a college course called Black Prison Narratives. This reads as an encyclopedic, yet passionately opinionated overview of material that is covered with greater depth in "The New Jim Crow" and the masterful documentary "13th" directed by Ava Duvernay ("Selma"). It's eye-opening information about how the industrialized prison program operates and how it has failed. Reagan's War on Drugs and Clinton's criminalization policies are brought into light as crushing missteps in efforts to retain power instead of address the root causes of crime in minor This reads as an encyclopedic, yet passionately opinionated overview of material that is covered with greater depth in "The New Jim Crow" and the masterful documentary "13th" directed by Ava Duvernay ("Selma"). It's eye-opening information about how the industrialized prison program operates and how it has failed. Reagan's War on Drugs and Clinton's criminalization policies are brought into light as crushing missteps in efforts to retain power instead of address the root causes of crime in minority communities. If you are of the "lock em up and throw away the key" mentality, you should give this book a chance to open another perspective for you. It's also worth mentioning that the illustrations in this book are stark and powerful. They add a lot to the reading experience, creating something between a graphic novel and an expose highlighted by street art. This book serves as a decent primer on the Prison Industrial Complex. Although it is a little bit reformist and not radical enough for my taste (and there are a few typos and misprints in the first edition) I would def. recommend it to someone who is looking for a short read that covers most of the bases. Also glad this references much better books that go more in depth on the subject, as usual, got some more reading to do! There are better books about the Prison Industrial Complex, books that are more thorough and policy-savvy, but as it says in the title, this is for beginners and all in all, it's not a bad place to start. A great overview of the PIC. Many references are given for further reading. Gave 2.5 stars. Packed with information (this can be a good and bad thing). The print was a bit "tight" on the page and made the pages seem to go on forever! This could be daunting to some readers. A copy editor or even book designer could have helped. The graphics were decent and a good reprieve from the tight pages. Overall, I think its a cool book with lots of good information but the layout wasn't quite reader friendly. This is not one that I could see myself reading again.